I applaud the FAA for breaking ground December 4th on a great new state-of-the-art Air Traffic Control System Command Center near Warrenton, VA. Certainly there can be no dispute that any time they can upgrade anything at FAA, all of aviation will be better served. Without out nation's air traffic controllers, what is the FAA anyway? The answer: FEMA. See, in a rational world where top managers value their rank and file as a necessary resource, money is spent on labor before anything else. In some of this country's most successful tech companies, Managers and Average Joe workers are put on the same team, collectively making decisions that steer the ship. But when FAA ignores their controllers and fails to give them a fair labor deal, it does nothing but ruin any shred of morale left in the system's towers and TRACONS. And when 60 pressurized tubes full of citizens are converging on JFK, the last thing you really want are tired, pissed off controllers working those flights. I hate to bring this up again, but maybe the next FAA administrator will see that the " headquarters" for air traffic control efficiency is not a building at all, but the men and women of NATCA. And those controllers are livid that they have been overlooked for so long. "The controller workforce has been working under imposed terms and conditions of employment for 824 days, because the FAA refused to complete negotiations under a flawed collective bargaining process. While almost 4000 controllers have left the FAA over the past 27 months, the FAA has done its best to distract the flying public from the ever-decreasing margin of safety with its dog and pony show, the Command Center ground breaking being the latest - akin to painting the house to make it look better while the roof is caving in. NATCA applauds our members for vividly pointing out how terribly misguided FAA leadership priorities are." There can only be one way to view this latest escalation in FAA vs. NATCA...and that is to hope President Obama can order FAA to make cleaning up this labor mess their first priority before anything else is even discussed. Yes, our new President has a full plate, but he is maybe a billion times more intelligent then the Lame Duck he replaces, so certainly his administration will realize how detrimental to public safety it will be to let the controller labor dispute deteriorate further. Because when 767's trade paint over Omaha, it will be too late. 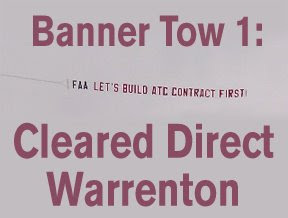 UPDATE @1012A on 12.07.08: I received many emails to the affirmative on this post, but one was from the people who organized the banner tow operation – Operation 10,000 Marbles – which they called a success. It was organized by and paid for by the bloggers at The Potomac Current And Undertow, a blog from/for/about/to the air traffic controllers at the Potomac TRACON. They also wanted me to point out that this was a grass roots operation and NATCA did not pay for it.